There are times in life when nothing meaningful seems to be happening. You’re content but you wonder what is next, and when it’s coming. I’d been in the marinade for months, when my friend, Dr. J invited me to visit her in her hometown in rural Iowa. A new man, her perfect match, had recently entered her life. “Good Dave,” I’d called him for distinction because we both knew another Dave who hadn’t warranted the “Good” moniker. He and Dr. J were regulars with their friends for Tuesday night summer motorcycle rides to eat chicken wings at an outdoor beer garden. My invitation was to join them for chicken wing night. I hesitated, resisting a long trip to the country on a “school night.” The idea of a motorcycle ride also made me uneasy. Dr. J’s gentle persuasion made me agree to step out of the marinade. Tuesday came and it was rainy and cool and part of me hoped we’d cancel. Close to the hour of departure the clouds suddenly cleared and the bright sun popped up without derailing the cool afternoon. We got to Stormer’s and the group of friends welcomed me. Most of them had grown up together in rural Iowa and their rich history of connectedness was palpable. They even shared their own nicknames for each other and each nickname came with a story. The friends all had on motorcycle regalia, most of which said “Harley Davidson.” I had grabbed a Lulu Lemon yoga jacket on my way out the door, and at my daughter’s insistence I’d changed out of my Tori Burch ballet flats and into a pair of suede shoes with a heel. My motorcycle outfit looked wimpy and out of place and gave away the fact I was a novice, and a city girl. Stormer tenderly gave me instructions on how to be a dutiful passenger, reassuring me that he would drive safely. I told him he had come highly recommended, and gingerly climbed aboard his motorcycle, finding my place in the comfortable seat behind him. 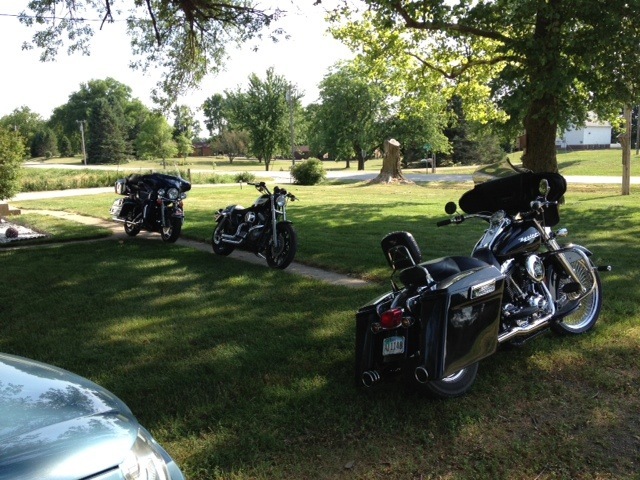 The motorcycles and one jeep without a top or doors began our caravan to the beer garden, which was 30 miles away, and deeper into the Iowa countryside. Stormer cranked music that played from the belly of the motorcycle while leather handle bar streamers flapped in the wind. It made me remember the sparkly streamers I’d had on my bicycle as a little girl. I began to feel the same freedom I’d had when I’d ridden my bike only this time I got to look at the lush green Iowa countryside as Stormer took confident control of the navigation. Our bike was number two in the lineup and I peeked in the rearview mirror and smiled as I saw the crew lined up behind us. As we passed farm houses and tractors plowing the fields, I wondered what it might have been like to grow up in a rural community. I began to relax in the country air and I leaned into Stormer’s strong body like my armor of protection. The radio kicked into a familiar classic oldie, and I went back in time mentally retracing my steps since that era. I felt like God was showing me I’d had a good life, and that the simple parts of life like I was experiencing on the motorcycle had been the most important part of it. Being in the marinade had a purpose. We got to the beer garden where I grabbed Stormer’s shoulder and hoisted myself off the bike, making my way to the outdoor picnic table. Once there we met up with other friends, more nicknames being gleefully exchanged, and a big group of motorcycles were all parked in perfect alignment out front. Soon we were eating greasy chicken wings and drinking cold beer from the iced bucket of long necks. “You are under medical supervision to eat this food,” joked Dr. J, my clean eating guru. The lighthearted fun continued as the sun went down. I watched newcomers come and go from the patio, recognizing the same small town easiness in all of them I had admired in our group. I felt myself surrender my walls, letting go of my city attitude and giving freedom to my authentic self. Soon it was dark, and time to leave. The night had turned cooler so Stormer opened a compartment on the motorcycle and took out a heavier jacket that displayed “Harley Davidson” on the front. It was big enough to have room for three of me, but I put it on over my yoga jacket and zipped it up. I hopped easily into my place behind Stormer like a pro, and the caravan was off. I was warm on the bike, contentedly full of wings and at ease with myself. Stormer skillfully maneuvered the bike on our ride home. We stopped at a stop sign and moved alongside Good Dave’s bike. He and Stormer exchanged nods, and the order of the lineup changed. On the last leg home, we were in the lead. Our route took us deeply down Twister Hill. We were surrounded by a canopy of ancient intertwined tree branches shrouding us in mysterious darkness except for a glimpse of moonlight that barely peeked through. The music played and the bike engine roared as we began to climb back up the hill on the other side of where we’d come. Suddenly we were in the unfettered spotlight of the most magnificent full moon I have ever seen. Bright, strong, and magnetic, it released a wave of joyful night energy that pulsed within me as it guided us home. Stormer was mesmerized by it too, and we commented with awe at it’s amazing beauty. I took a mental snapshot, wanting to remember the moment forever because it was perfect. The moon, the night, the company, the ride, the serenity, and most of all the reminder from God through the beauty of His creation, that as life moves forward, everything is as it should be.